Fula women in the East Province of Cameroon. Guinea, Cameroon, Nigeria, Senegal, Central African Republic, Burkina Faso, Benin, Mali, Niger, Gambia, Guinea Bissau, Ghana, Chad, Sierra Leone, Mauritania and Sudan. The Fula or Fulani is an ethnic group residing in many countries of West Africa. They are concentrated principally in Nigeria, Mali, Guinea, Cameroon, Senegal, and Niger, though they are also spread throughout Mauritania, The Gambia, Sierra Leone, Burkina Faso, Guinea Bissau, Côte d'Ivoire, Togo, Central African Republic, Ghana, Chad, Liberia, and as far as Sudan in the east. They refer to themselves as Ful or Fulbe and are also called Peul. The Fulani are the largest nomadic group of people in the world and have played an influential role in politics, economics, and religion throughout Western Africa for over a thousand years. Historically, the Fulani played a significant role in the rise and fall of ancient African empires such as the Ghana Empire, the Mali Empire, Songhai, and the Mossi states. The Fulani were the first group of West Africans to convert to Islam, and they played a principal role in the spread of Islam throughout West Africa. The Fulani follow a code of behavior known as Pulaaku, consisting of the qualities of patience, self control, discipline, prudence, modesty, respect for others (including foes), wisdom, forethought, personal responsibility, hospitality, courage, and hard work. The original Fulani people were of North African or Middle Eastern origin. 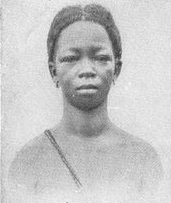 As such, they had lighter skin, thinner lips, and straighter hair, and are referred to by many Africans as "white people." Current Fulani peoples contain a large number of people from diverse backgrounds who became a part of the Fulani through conquest and religious conversion. The Fulani were the first group of West Africans to convert to Islam through jihads, or holy wars. In continuing religious conquest, they took over much of West Africa and became a political and economic force in addition to a religious force. The largest nomadic group of people in the world, they've played an influential role in politics, economics, and religion throughout Western Africa for over a thousand years. The introduction of Islam throughout West Africa is due in large part to the Fulani. Following Islamic conquest in the 1800s, non-Islamic Fulani eventually joined ranks with their fellows to form an extensive and powerful empire. The Fulani were traditionally a nomadic, pastoral people, herding cattle, goats, and sheep across the vast, dry hinterlands of their domain, remaining somewhat distant from the local agricultural populations. Today, having interacted with other groups, they have developed a broader variety of social and economic patterns. However, those who continue in the pastoral tradition today enjoy greater prestige than those who do not, as they are considered the truest representatives of Fulani culture. Originating from the area near the upper Niger and Senegal Rivers, the Fulani were cattle-keeping farmers who shared their lands with other nearby groups, like the Soninke, who contributed to the rise of Ghana. During the sixteenth century the Fula expanded through the sahel grasslands, stretching from what is today Senegal to Sudan, with eastward and westward expansion being led by nomadic groups of cattle breeders. While the initial expansionist groups were small, they soon increased in size due to the availability of grazing lands in the sahel. Agricultural expansion led to a division among the Fulani, where individuals were classified as belonging either to the group of expansionist nomadic agriculturalists or the group of Fulani who found it more comfortable to abandon traditional nomadic ways and settle in towns. Fulani towns were a direct result of a nomadic heritage, and were often founded by individuals who simply chosen to settle in a given area instead of continue on their way. Settled and nomadic Fulani began to be seen as separate political entities, each group ruled by a different leader. The first leader to emerge for the nomadic Fulani in the plains between the Termes and Nioro was Tenguella Koli, who objected to the control the Songhai Empire exercised over the homelands of Ancient Ghana. Primarily objecting to the Songhai rule of Askia Muhammad, because it limited available land for grazing, Tenguella led a revolt against the empire in 1512. He was killed in battle with an army led by the brother of Askia Muhammad near Diara during the same year. The rebellion against Songhai rule continued, however, when Tengualla's son, Tengualla Koli, led his father's warriors across the Upper Senegal River and into Badiar, a region north-west of the Futa Jallon Mountains. Once in Badiar, he was joined by many Mandinka soldiers, who had rallied to his cause and embraced him as a relative of their leader, the emperor of Mali. The combined forces of the Fulani and the Mandinka continued onward to Takrur, an ancient state in Futa Toro. There they subdued the Soninke chiefs in power and set up a new line of kings in 1559. The occupation of Futa Toro caused the Fulani people to be identified as a settled, urban–based community, as opposed to the traditional pastoralist ways that emphasized the nomadic nature of cattle herding. The shift from a nomadic civilization to an urban society mandated changes in agricultural production, settlement building, and water conservation. Through the occupation of Futa Toro, the Fulani people came to accept structures of urban authority not traditionally seen in nomadic tribes. For example, urban life necessitated political authority being allocated to chiefs and ruling families. The Fulani that occupied Futa Toro held fast to traditional religious beliefs, instead of converting to Islam, the prominent religion of the area. Their religious views caused many Muslim traders in the area to relocate to predominantly Muslim areas, leading to a decline in trade and the commercial value of Futa Toro. The rising power of the Fulani led to northward expansion in the early nineteenth century, coming into direct conflict with the outer reaches of the Oyo Empire. Expansion was led by Usman dan Fodio, who led the Fulani to became the leaders of a centralized Fulani Empire. Expansion in this period was often tied to religion, particularly an attempt by many Fulani leaders to reform Muslim practices in the area and bring people to Islam. This period of time also gave rise to the jihad state, a territory that was established by political and religious Muslim leaders who conquered a region by offensive war, invoking Jihad, or "holy war." The rulers of jihad states often assumed the honorific title of Emir, an Arabic title which can mean general as well as prince or governor, or a derivate in a local language. One of the newly formed Muslim states resulting from religious expansion, the Fouta Djallon, was founded in 1735. Formed when Fulani Muslims decided to rise against the non-Muslim Fulanis and Djalounkes rulers to create a confederation of provinces, Fouta Djallon, was located mainly in present day Guinea, as well as parts of Guinea Bissau, Senegal, and Sierra Leone. Under the rule of Alpha Ibrahima Sory Maoudho, the first Almamy in 1735, it rose to become a major political force with a written constitution and the governance of the area rotating between the 2 main parties: The Soriya and the Alphaya. With the capital Timbo in present day Guinea, the Fouta Djallon state lasted until 1898, when French colonial troops defeated the last Almamy, Bokar Biro Barry. They then dismantled the state and integrated it into their new colony of Rivières du Sud, which became Guinea. 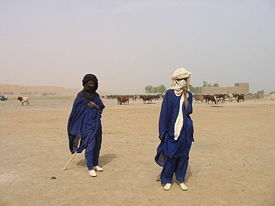 Fulani herders in Mali, 2005. The language of Fulanis is Pulaar or Fulfulde, depending on the region of the speaker and spoken variations. The Fulani share a language with the Tukulor, leading to the title of Halpulaar, or Haalpulaar'en, for all Senegalese who speak the language ("hal" is the root of the Pulaar verb haalugol, meaning "to speak"). Fula is classified within the Atlantic branch of the Niger-Congo language family. With the exception of Guinea, Fulas are minorities in every country in which they live. Because of this, many Fulanis also speak the language of their home country. The traditional dress of the Fula in most places consists of long colorful flowing robes, richly decorated, mostly through embroidery. Fulani women also traditionally use Henna around the mouth, resulting in a blackening around the lips. The Fula have a rich musical culture and play a variety of traditional instruments, including drums, hoddu (a plucked skin-covered lute similar to a banjo), and riti or riiti (a one-string bowed instrument similar to a violin), in addition to vocal music. The well known Senegalese Fula popular musician Baaba Maal sings in Pulaar on his recordings. ↑ Art and Life in Africa. Fulani Information. Retrieved June 21, 2007. ↑ Paul Weekley, Fulani Pathways—Pulaaku Ethics, Jamtan. Retrieved June 22, 2007. Africa Guide. African Tribes; Fulani People. Retrieved June 22, 2007. University of Iowa. Fulani Information. Retrieved June 22, 2007. World Statesmen. 2000. Traditional States of Nigeria. Retrieved June 22, 2007. This page was last modified on 15 May 2017, at 21:06.